By his own admission, one of the U.S Navy's top commanders says his Pacific fleet "gets all the best stuff" when it comes to state-of-the-art weaponry - an undeniable reflection of President Barack Obama's so-called pivot towards Asia. The flagship of its 7th fleet, the Nimitz-class USS George Washington aircraft carrier boasts a formidable arsenal; from the latest FA-18 fighter jets, to anti-submarine helicopters and early-warning surveillance aircraft. Add to this the fleet's numerous missile destroyers, cruisers and submarines and the statement of intent is clear to see - Washington is serious about its role in the region. 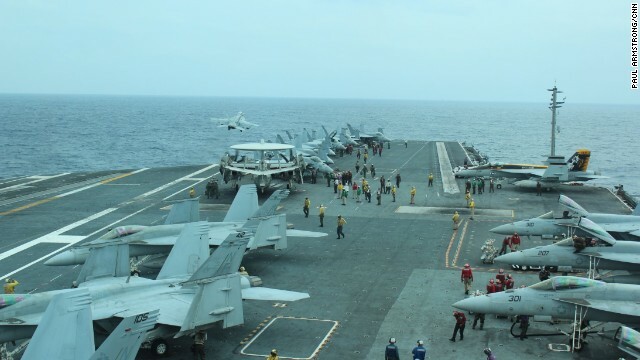 "It's a long-term effort for us here," Fleet commander Vice Admiral Robert L. Thomas, told CNN aboard the giant vessel amid the muffled roar of jet engines from the flight deck directly above. "From a policy perspective it's a shift in balance of not only our resources but our thinking across diplomatic, information, economic and military lines to the Pacific. "But I would offer that the 7th Fleet never left - we've been a strong presence here for the past 70 years. We're slowly shifting from a 50/50 mix in the United States Navy to a 40% Atlantic, 60% Pacific mix," he added, referring to the gradual swing away from traditional areas of operation in the West. Great – I should certainly pronounce, impressed with your web site. I had no trouble navigating through all tabs and related info ended up being truly easy to do to access. I recently found what I hoped for before you know it at all. Reasonably unusual. Is likely to appreciate it for those who add forums or something, website theme . a tones way for your customer to communicate. Excellent task. I have been exploring for a little bit for any high quality articles or weblog posts on this kind of space . Exploring in Yahoo I at last stumbled upon this web site. Studying this info So i am happy to exhibit that I have an incredibly excellent uncanny feeling I came upon exactly what I needed. I most definitely will make certain to don’t forget this web site and give it a look regularly. China cannot be trusted. China is a bully and greedy. China does not follow rules of navigation. China signed UNCLOS but does not abide by its rules. The chinese are claiming the whole neighbors territory just because of the natural resources.. but before never claim this disputed island even in the international law that make falls claim and make fake historical issue...chinese are only interested when natural resources was discovered by u.s. navy during the 60s.on that time china never diclared that all of whole china sea are there own territory and sovereignty when the u.s. bases still in the philippines. during year 1500 the ming dynasty limahong gallon was making barter trade with the spaniard at that time known as panay archiphelago and the pilipino are malayans.now how can the chinese claim by history and even in the history there is no nine dash name the philippines was discovered by magellan in 1500 hundred making survey and then given name and put in the map known as maynilad in terms of limasawa. No one can chinese making history that put the discovery of the earth . Spaniard make all expedition and maping that the earth are round chineses are only making barter trade making busuness thats all. Well stated, John and so very true, too. Thank you. Take out the Washington and the other US carrier in the Far East, Yokohama, Okinawa, Guam, and Pearl and you can scrach the US Navy's presence in the Western Pacific. That seems to me to be a very good idea, Aztec59. Let's put the money to better uses! Oh, so that's all would take. No problem! Good grief, what a gigantic waste of U.S. taxpayer money!!! That money could be far better spent on trying to find a cure for Alzheimer's disease. I've seen close up at just how devastating this horrific disease can be by watching a friend of mine suffer from it! Unfortunately, a lot of right-wing nut jobs here are in such a Huzzah over building this stupid naval power of ours that they just don't care about Alzheimer's or any other hopeless disease of our time! Now watch the idiot comments begin!!! Unfortunately you can't just pour more money into disease research and come up with a quick fix. Look at the billions spent world wide on cancer research. Granted we are making progress, but it's taken decades to get this far and by all means, cancer has not been "cured". On the other hand, the US needs to protect our economic sphere of influence in the Far East and one way is to project power against those who would like to dominate and manipulate the markets and resources of those smaller nations that we trade with. That's why we maintain a strong military presence in that part of the world. It's not about war. It's economics, so you can't compare "apples" of medical research and the "oranges" of a nation's economic well being and ultimate survival. Don't you think Portland, that by pouring some of that ill spent money back into the national economy that we will be better off? As for the Far East, let Australia, Russia, New Zealand, China and Vietnam take are of that part of the world. We just simply cannot do it all! Let's put our priorities where they belong!!! There is no connection between the two things you mention. None.